Best Shark Dives in the World! Are you a shark fanatic? Do you aspire to dive the best shark dives in the world? Do you scour magazines, books and the web in search of the top shark diving locations? If you spend your life in the pursuit of diving with sharks, you must come to the Philippines! The Philippines has two amazing shark diving trips that should be on any shark diver's list of Top 10 Shark Dives. The first shark diving location is Malapascua Island. Its unique thresher sharks are a sight you are unlikely to see anywhere else. The second is the whale sharks of Donsol, thought to be the largest congregation of whale sharks in the world. Swimming with whale sharks is an experience not to be missed. Other sharks your might see at these destinations include whitetip sharks, hammerhead sharks, bamboo sharks and others. Located in the 'Golden Triangle of Marine Biodiversity' - the richest and most diverse area of marine life in the world - the Philippines also offers some amazing other diving opportunities. And the prices cannot be beaten! Malapascua Island in the Philippines is the only place in the world where you can reliably see the the very rare thresher shark. For you shark lovers out there, it is a must see alongside great white shark cage diving in South Africa, hammerhead sharks in Cocos and the tiger sharks and reef sharks of the Bahamas. Make sure Malapascua's thresher sharks are on your list of Top 10 Shark Dives. Many people rate it one of the best Shark Dives in the world. It is certainly one of the most unique! Find out more. Donsol in the north of the Philippines is a little known treasure in the diving community, but its fame is spreading rapidly as the city has done a magnificent job of promoting its eco-friendly tourism and its whale shark tours. Average sightings are 5-10 whale sharks in a day with reported sightings of up to a staggering forty five whale sharks in one day! Although Donsol Bay itself is snorkeling only, if you want to do whale shark diving, there are dive sites where you have an excellent chance of seeing whale sharks while scuba diving. 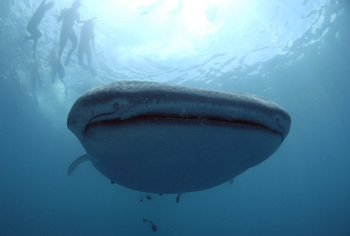 Find out more about Donsol's whale sharks. NEW!!! Dive with whale sharks and thresher sharks on one of our specialy designed Donsol-Malapascua Dive Safaris!